This unique work brings together contributions from the world's foremost authorities on a subject of wide-ranging importance both to continued scientific investigation and major industrial processes. Carbocations are involved in petroleum cracking and refining, coal processing, polymerization chemistry, synthetically important solvolytic reactions, isomerizations and rearrangements, addition reactions, aromatic substitutions, and a variety of biosynthetic transformations. Dedicated to George Olah for his pioneering and inspirational efforts in the field, Stable Carbocation Chemistry uncovers fertile ground for continued research and further practical application in this dynamic and still-growing field. G. K. SURYA PRAKASH, PhD, is Professor of Chemistry at the University of Southern California at Los Angeles, California. His primary research interests are in the area of carbocation, superacid, hydrocarbon, and synthetic organic chemistry. He has published more than 280 scientific papers in the field and has coauthored and edited three books. PAUL v. R. SCHLEYER, PhD, is Professor of Chemistry at the University of Erlangen-Nurnberg, Erlangen, Germany. His main research interests are in the area of mechanistic, structural, and computational chemistry. He pioneered the applications of theory to intriguing chemical problems. He is highly prolific with more than 800 scientific publications to his credit and has coauthored or edited more than 10 monographs. Recollection of My Search for Stable Long-Lived Carbocations in Superacid Solution (G. Olah). 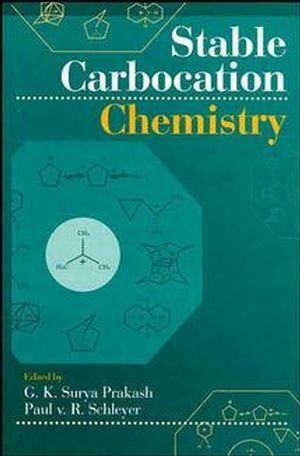 New Carbocations and Dications (G. Prakash). Structure and Dynamics of C9H9+ Ions: An Experimental and Theoretical Comparison (P. Ahlberg). Some Aspects of Carbocation Rearrangements (V. Shubin & G. Borodkin). Isotope Effects as a Probe of Subtle Features of Carbocation Structures in Superacids (D. Forsyth). CPMAS NMR of Carbocations at Cryogenic Temperatures (P. Myhre & C. Yannoni). Surface and Interface Studies of Organic Ions (D. Clark). Natural Product Chemistry in Superacids (J. Jacquesy).